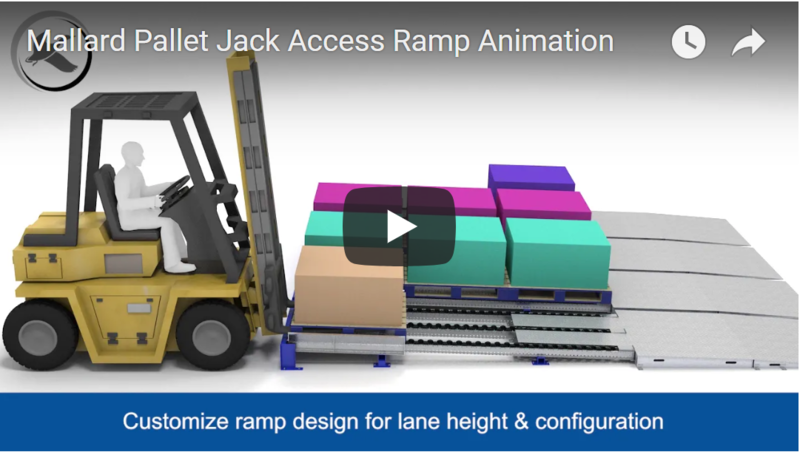 Our latest 3D animated product video shines the light on the benefits of the pallet jack access ramp – a Mallard engineered application for pallet flow. The ramp is a creative, cost-efficient solution that allows a pallet jack to access floor-mounted pallet flow in work-in-process (WIP), assembly or staging operations. The order selector simply walks the pallet jack up the ramp which is custom designed to the elevation of a pallet flow lane to access and extract a pallet. Floor-mounted pallet flow in WIP, assembly and/or staging areas minimizes travel and organizes inventory while maximizing warehouse space and productivity flow. Accessing the pallet flow lanes with a pallet jack for pallet extraction further reduces warehouse traffic, equipment costs, and labor expense. Pallet flow is simply a better tool than bulk stacking for optimizing floor space and managing inventory and processing costs. And the pallet jack is much more nimble, fast and affordable than a forklift. The combination of the two increases safety and efficiency while reducing costs in staging and assembly areas. Ramps are manufactured using a heavy-duty galvanized material and then “textured” to provide a grip surface that prevents pallet jacks and operators from slipping while entering or extracting a pallet. Contact the Mallard gravity flow experts to discuss your inventory flow needs. 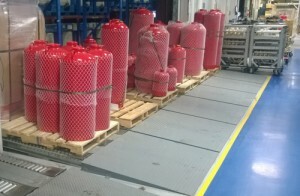 Our products are designed to work together as creative solutions to unique warehousing challenges. We even recommend testing out your gravity flow design before ordering to ensure that the solution will meet your needs. Call today to schedule your free consultation.